There’s stupid, really stupid, truly stupid, and Democrat stupid. (CNSNews.com) – Vice President Joe Biden told people attending an AARP town hall meeting that unless the Democrat-supported health care plan becomes law the nation will go bankrupt and that the only way to avoid that fate is for the government to spend more money. Spend your way out of bankruptcy. There you go. It sounds really good. But I’ve got a couple neighbors on my street who tried it – and it turns out that it doesn’t work out all that good. You see things walking your dog every evening. Like what kind of cars people own, and what kind of expensive “toys” they have in their garage, and whether or not they’ve had pools installed or not. There are two homes that are now standing vacant on my street. And both of them had two expensive luxury cars in the driveway, and a number of toys such as jet skis (in one) and quads (in the other) in the garage. And one had put in a below-ground swimming pool. Both couples were young enough that I wondered, “Where did they get the money to buy all this stuff?” up until the very day I saw the moving trucks and then the foreclosure signs. Nope. You don’t spend to keep from going bankrupt. You spend to go bankrupt even FASTER. And, for the record, it is invariably excessive spending that puts people on the racetrack to bankruptcy in the first place. Now, in business, or even in homes, one might make a relatively expensive purchase that will so reduce costs during the lifetime of the “gadget” that it justifies the initial outlay. A new computer system that will streamline and optimize the accounting system; a new refrigerator that replaces a worn-out, energy-wasting unit. Now, no rational business owner or homeowner would make such major purchases if they are already deeply in debt: the best move for either would be to pay down their highest-interest debts, which would save FAR more money in the long run. Buying more stuff would just add to your already-too-high payments. Even a sound purchase is unsound if you don’t have the cash on hand to pay for it. I think budget experts such as Suze Orman (who offers such rare pearls of wisdom as “Saving is good; going into massive debt is bad”) would agree with me on this one. But is Joe Biden talking about a big purchase that will save money down the road? Answering questions from Democrat Kent Conrad of North Dakota at a hearing of the Senate Budget Committee today, Elmendorf said CBO does not see health care cost savings in either of the partisan Democratic bills currently in Congress. Conrad: Dr. Elmendorf, I am going to really put you on the spot because we are in the middle of this health care debate, but it is critically important that we get this right. Everyone has said, virtually everyone, that bending the cost curve over time is critically important and one of the key goals of this entire effort. From what you have seen from the products of the committees that have reported, do you see a successful effort being mounted to bend the long-term cost curve? Elmendorf: No, Mr. Chairman. In the legislation that has been reported we do not see the sort of fundamental changes that would be necessary to reduce the trajectory of federal health spending by a significant amount. And on the contrary, the legislation significantly expands the federal responsibility for health care costs. Conrad: So the cost curve in your judgment is being bent, but it is being bent the wrong way. Is that correct? Elmendorf: The way I would put it is that the curve is being raised, so there is a justifiable focus on growth rates because of course it is the compounding of growth rates faster than the economy that leads to these unsustainable paths. But it is very hard to look out over a very long term and say very accurate things about growth rates. So most health experts that we talk with focus particularly on what is happening over the next 10 or 20 years, still a pretty long time period for projections, but focus on the next 10 or 20 years and look at whether efforts are being made that are bringing costs down or pushing costs up over that period. As we wrote in our letter to you and Senator Gregg, the creation of a new subsidy for health insurance, which is a critical part of expanding health insurance coverage in our judgement, would by itself increase the federal responsibility for health care that raises federal spending on health care. It raises the amount of activity that is growing at this unsustainable rate and to offset that there has to be very substantial reductions in other parts of the federal commitment to health care, either on the tax revenue side through changes in the tax exclusion or on the spending side through reforms in Medicare and Medicaid. Certainly reforms of that sort are included in some of the packages, and we are still analyzing the reforms in the House package. Legislation was only released as you know two days ago. But changes we have looked at so far do not represent the fundamental change on the order of magnitude that would be necessary to offset the direct increase in federal health costs from the insurance coverage proposals. In other words, the Obama administration is going to spend a ton of money in order to buy something that will cost even more money than the thing it replaces. Not exactly a Consumer Reports “Best Buy” recommendation. Don’t listen to Barack Obama and Joe Biden. They are genuinely clueless idiots who will quickly spend this country into bankruptcy all the while assuring us that they are somehow spending us out of bankruptcy. It doesn’t make any sense in your small business, it doesn’t make any sense in your home, and even though the federal government has a giant printing press to “make money,” it doesn’t make any sense in the White House. Stop and think about this picture. Realize that Democrats – who are and have been demagogues in every sense of the word – repeatedly positioned themselves as the party of fiscal responsibility against Bush spending. And then the moment they get the chance – from the very first nanosecond – they blow up the budget deficit the way terrorists blew up the World Trade Center towers. And, before anyone object to the comparison to terrorism, let me clarify myself even further. Terrorists can only do so much damage. What Obama did to the federal budget dwarfs anything terrorists could have done to us. The commander-in-chief of the most powerful nation in history has declared total war on fiscal responsibility. It’s actually woefully inadequate to compare what Obama did to the budget to a mere terrorist attack. President Barack Obama has repeatedly claimed that his budget would cut the deficit by half by the end of his term. But as Heritage analyst Brian Riedl has pointed out, given that Obama has already helped quadruple the deficit with his stimulus package, pledging to halve it by 2013 is hardly ambitious. 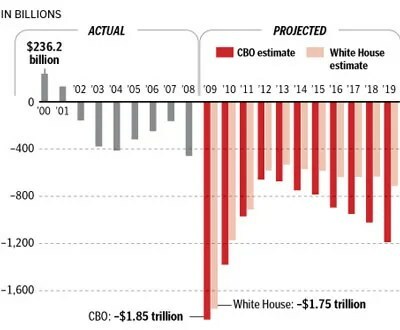 The Washington Post has a great graphic which helps put President Obama’s budget deficits in context of President Bush’s. Let me put it another way: Suppose I punch you in the mouth 100 times, sending you to the hospital on life support with a face that will never again be the same no matter how many reconstructive plastic surgeries you have. Would it make you feel better if I told you that – next time around – I’d only punch you in the mouth fifty times? The man who exploded a nation’s debt in a way never before seen in the entire history of the human species is poising himself to take credit for his fiscal responsibility by only exploding it half as much as his initial nuclear blast. And we’re actually supposed to be grateful for it! It needs to be mentioned that this is just the spending Obama has proposed in the first 6 months of his term along with the forecasted trends that spending will entail. It only stands to reason that the actual future spending will only increase, and these already truly terrifying numbers will only get worse over the next few years. We literally aint seen nothin’ yet. President Obama’s ambitious plans to cut middle-class taxes, overhaul health care and expand access to college would require massive borrowing over the next decade, leaving the nation mired far deeper in debt than the White House previously estimated, congressional budget analysts said yesterday. In the first independent analysis of Obama’s budget proposal, the nonpartisan Congressional Budget Office concluded that Obama’s policies would cause government spending to swell above historic levels even after costly programs to ease the recession and stabilize the nation’s financial system have ended. Tax collections, meanwhile, would lag well behind spending, producing huge annual budget deficits that would force the nation to borrow nearly $9.3 trillion over the next decade — $2.3 trillion more than the president predicted when he unveiled his budget request just one month ago. The result, according to the CBO, would be an ever-expanding national debt that would exceed 82 percent of the overall economy by 2019 — double last year’s level — and threaten the nation’s financial stability. “This clearly creates a scenario where the country’s going to go bankrupt. It’s almost that simple,” said Sen. Judd Gregg (N.H.), the senior Republican on the Senate Budget Committee, who briefly considered joining the Obama administration as commerce secretary. “One would hope these numbers would wake somebody up,” Gregg said. Probably not, given that we are a ship of fools captained by the worst fool in American history. Those figures prompted criticism from Democrats, such as Howard Dean, who has called for a repeal of Bush’s tax cuts. “The president has not only destroyed three million jobs, he is destroying the financial future of our children with these crazy tax cuts for the top 1 percent,” the former Vermont governor said in a telephone interview. But the best line of the day came from Bob Graham. If the Democrats cannot win an election on those issues, then frankly the country deserves what it gets. These are George Bush’s deficits, and the voters need to be reminded of that every day between now and next November. For the record, unemployment was 4.4% in 2006 when Nancy Pelosi and Democrats took over the House and Harry Reid and Democrats took over the Senate. And the Dow was close to 12,000. But, apparently, total Democrat control of the House and the Senate somehow still never translated into any kind of Democrat responsibility for the slide that only began after they took power over Congress. Tax rate reductions increase tax revenues. This truth has been proved at both state and federal levels, including by President Bush’s 2003 tax cuts on income, capital gains and dividends. Those reductions have raised federal tax receipts by $785 billion, the largest four-year revenue increase in U.S. history. Liberals cannot even allow for the possibility that tax cuts might generate more revenue. So – as the following New York Times article exemplifies – they must be perennially surprised when tax cuts create larger tax revenue by stimulating more investment. It simply astonishes liberals that if government allows me to keep more of what I produce, that I might be inspired to try to produce even more. It wasn’t Bush’s tax cuts that created deficits; they clearly RAISED revenues, rather than lowered them. What created the deficits was massive spending (on 9/11, on Iraq, on Afghanistan, on Katrina, on the huge Bush Medicare drug benefit, etc. etc.). Massive spending. You know, like Obama is doing now – ONLY A HELL OF A LOT WORSE THAN ANYONE IN HUMAN HISTORY HAS EVER EVEN CONTEMPLATED BEFORE. But let’s put blame where blame belongs: Presidents are responsible for deficits. As Democrats repeatedly pointed out. Which is why any fair-minded Democrat (as though there actually were any) should be screaming in rage at the Obama insanity. Now we see what massive hypocrites and incompetents Democrats truly are. They didn’t scream at Bush’s deficits because they wanted fiscal responsibility; they only demagogued an issue for rhetorical benefit. They falsely positioned themselves as the party of fiscal responsibility – which was a joke even before Barack Obama came along and demonstrated it for the sickest and most twisted joke ever told. As a conservative, I DO criticize the huge deficits under George Bush. And I apply that same “fiscal responsibility” lens on Obama and see the worst economic manager in the history of the world. Ali Baba had his forty thieves. Ali Obama has at least 31 czars (reported today to be as high as 34) — and counting. Whether Ali OBama’s czars also qualify as “thieves” or not, I shall leave to you to determine. Reuters has a story entitled, “Obama fashions a government of many czars,” that begins, “Name a top issue and President Barack Obama has probably got a “czar” responsible for tackling it.” Personally, I kind of like the “czar-free” government our founding fathers fashioned for us better. Taxpayers for Common Sense have been trying to keep track of all the Obama czars. It’s difficult given the lack of accountability and openness that has emerged from the administration that said they’d make accountability and openness their hallmarks. These czars have no accountability to anyone but Obama. Democrats would be screaming bloody murder if George Bush had done such a thing, but mum has been the word as Barack Obama has ran an end-run around the Constitution (which has appallingly little regard for czars) and around Congressional oversight. It has taken President Barack Obama less than eight months to do what imperial Russia could not do in 400 years. Taxpayers for Common Sense reports that Obama has appointed 31 “czars.” That’s more than ruled Russia during its entire imperial history. Obama has appointed a California water czar, a Mideast peace czar and a Mideast policy czar, a pay czar (to determine how much the private sector should pay, not the government), a health care czar, an energy czar and a green jobs czar, a Sudan czar, a climate change czar and numerous others, with the promise of more to come. And, if you can’t keep track of all the czars, don’t worry. Obama has also appointed an information czar. The president should feel right at home when he visits Russia this week. Few of these czars require any congressional approval, but Obama has given many of them power over cabinet-level officials who are subject to confirmation. Taxpayers for Common Sense says all these appointments don’t guarantee that the federal bureaucracy will work any better. If anything, the group notes, the appointments simply add another layer to that bureaucracy, something that rarely makes the government more responsive to taxpayers. More worrisome is the clear trend towards the government, especially the federal government, getting involved in an increasing amount of our daily lives. Equally troubling is the idea that the solution to any problem that faces us is a stronger hand on the reins. The czars did Russian no favors. We have no reason to expect they will do the United States any good. Washington (AP) – Health care overhaul legislation from President Barack Obama’s congressional allies would create a federal insurance czar with sweeping new powers to oversee medical plans nationwide, an idea already drawing fierce criticism. To date, this administration has seemed more interested in penalizing and correcting businesses than in inspiring growth and profitability. Oversight measures are abounding, big and small. Next week the Treasury is set to release its plan for financial regulatory reform, which was meant to simplify the tangled web of overseers now in place – a system that grew up piecemeal as the banking and trading sector grew in size and sophistication. The word is that instead of reducing the number of agencies, Treasury Secretary Geithner will propose two new ones. Why? Because the congressional committees that are charged with monitoring these organizations refuse to give up power. I have to laugh. When you stop and think about it, Obama is seizing total control of everything while simultaneously arguing his administration really isn’t responsible for anything. That’s what makes me laugh. Rahm Emanuel, Ali Obama’s chief of staff, said something only a couple of weeks after the election – before Obama assumed his “unprecedented power” – that serves to show that none of this has been a coincidence. This seizure of sweeping, unprecedented power in the name of “crisis” in order to gain political advantage should truly frighten you if you understand history. Crisis is routinely identified as a core mechanism of fascism because it short-circuits debate and democratic deliberation. Hence all fascistic movements commit considerable energy to prolonging a heightened state of emergency (Liberal Fascism, p. 43). You can go back to a February 13, 2009 Wall Street Journal article to see that Barack Obama is firmly in precisely such a fascist crisis-hyping tradition. WASHINGTON (AP) — The government will have to borrow nearly 50 cents for every dollar it spends this year, exploding the record federal deficit past $1.8 trillion under new White House estimates. Budget office figures released Monday would add $89 billion to the 2009 red ink — increasing it to more than four times last year’s all-time high as the government hands out billions more than expected for people who have lost jobs and takes in less tax revenue from people and companies making less money. To put it bluntly, the fiscal policy of the United States is unsustainable. Debt is growing faster than gross domestic product. Under the CBO’s most realistic scenario, the publicly held debt of the U.S. government will reach 82 percent of GDP by 2019 — roughly double what it was in 2008. By 2026, spiraling interest payments would push the debt above its all-time peak (set just after World War II) of 113 percent of GDP. It would reach 200 percent of GDP in 2038. Ali Obama and his 31 (or is it 34? Incredibly, the media seems to have stopped reporting the growing number!) czars are no friends of America or the Constitution that framed its laws. And whether Obama and his gang of czars intend to or not, their “redefinition of the role of government in our economy and society” will very likely overwhelm our entire way of life and send it crashing down.